I feel like I’ve hardly been here of late. There have been plenty of things to write about, but, quite honestly, no time to write about any of them. 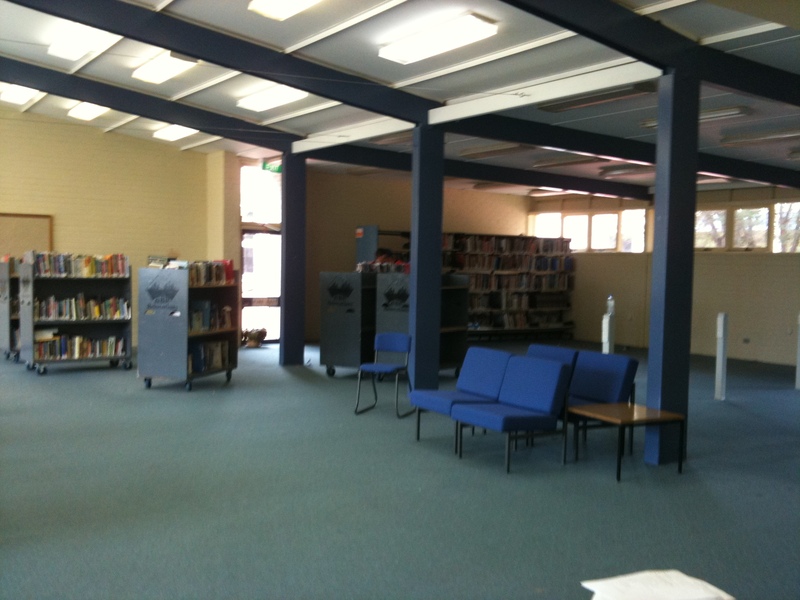 I’ve been pretty time poor because we’ve been in the process of relocating our school library to temporary accommodation in preparation for the construction of a new library in 2010. It’s all very exciting, but any new development means that you need to evaluate what you need and what you can do without. We’ve had a bit of time to think about this, hence our decision to do something like delete the VHS collection. Knowing we were moving and were going to be constrained in terms of space, we figured it was time to make tough decisions like this one. We also deleted quite a bit of non-fiction, but truthfully, the collection is still quite large and needs further deleting. Our fiction collection is quite large but it does get significant usage; it’s the only print collection we intend on growing. Next year we intend to explore ebooks and see how to integrate more of these into our collection. So, where are we now? We’ve moved from a substantial building with offices and space to house a collection and class spaces, to a double classroom and one other large room. First up, I’d like to thank ABR Relocations for doing a stellar job of moving our book collection and shelving. In two days, they moved the whole lot and set it up so that it looked even better than it did in its original location! Yes, we paid them, but a move like this is intense, back breaking work, and they did it in a very professional manner. Graeme and crew, thanks very much. And here’s what girls will resort to when they think they can find a bargain, even if it is an old cushion discarded from your school library! 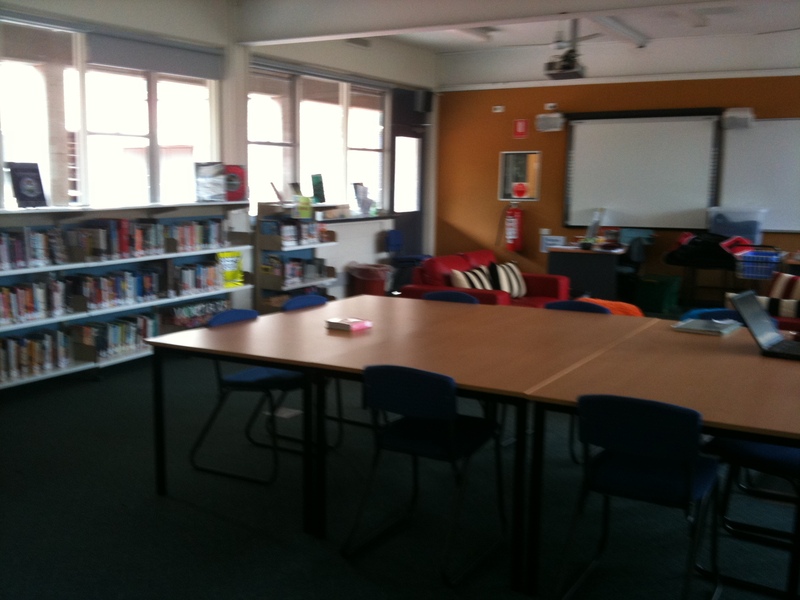 I thought you might like to see how we’ve set up the double classroom space. 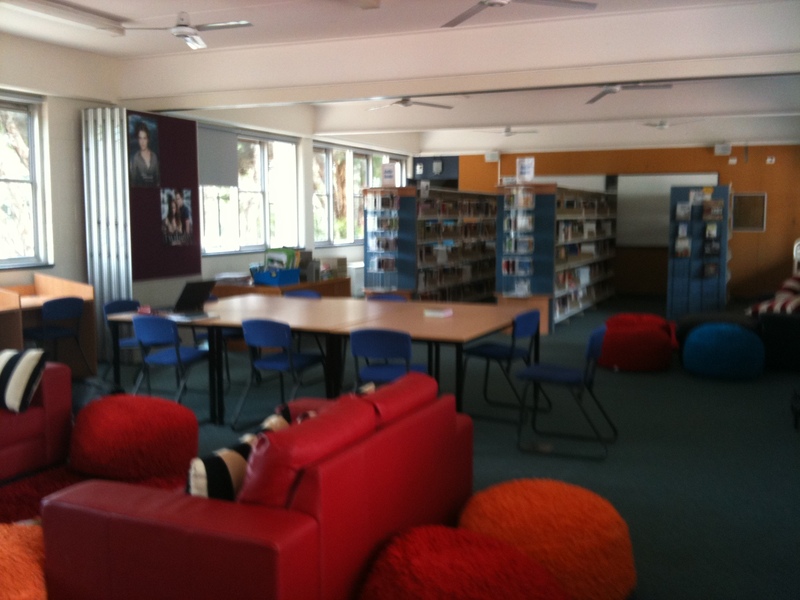 This is going to act as our main centre, housing fiction, some desktop computers (we’re a laptop school so don’t need huge banks of computers), and comfy, relaxed spaces encouraging our students to come in, take a look around, relax and read. It’s also housing our desks, and although it’s nice to be with the kids, some away space for planning etc is going to have to be factored in to help us maintain sanity! In this picture, you can see Catalogue, our Library cat, taking a nap on our new rug! I took these photos today, our first day back in operation. 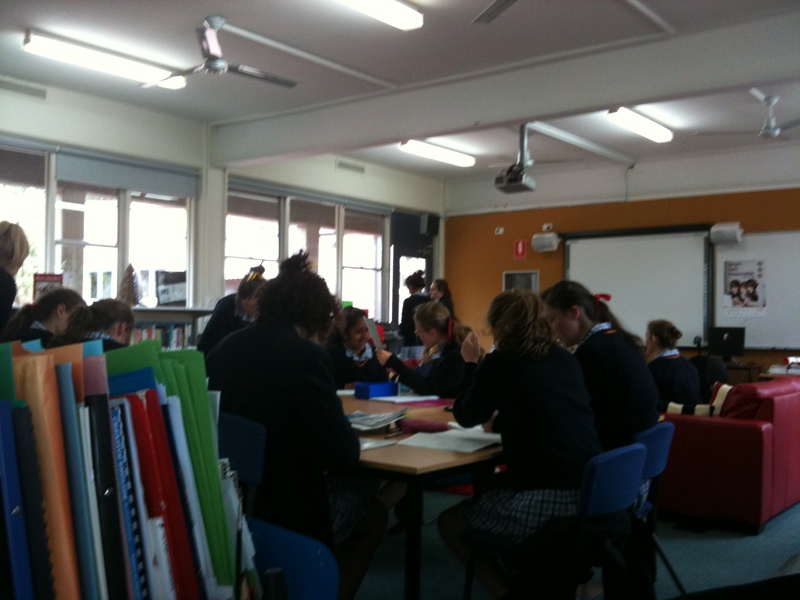 The students have found us and are pretty happy with the new surrounds. 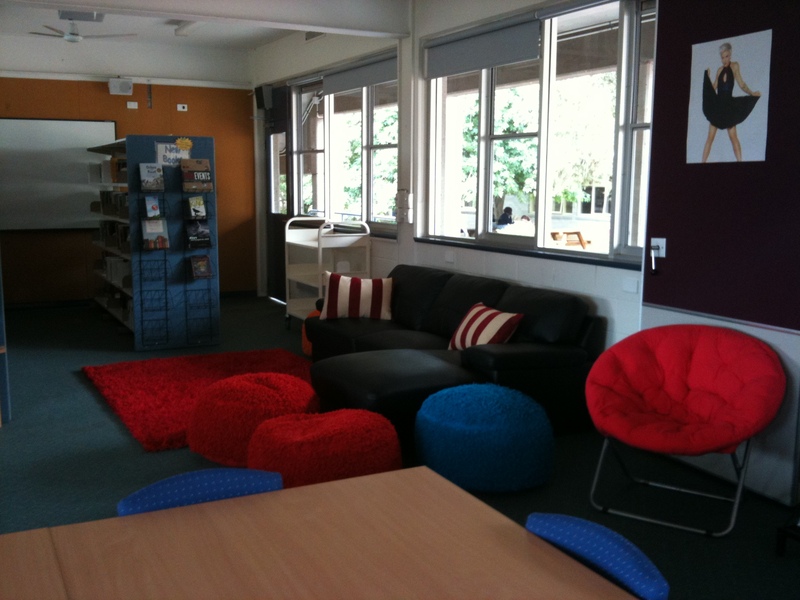 There have been lots of comments about how much they like the space and how they think it’s better than the old library! We were only closed for a week during this relocation. 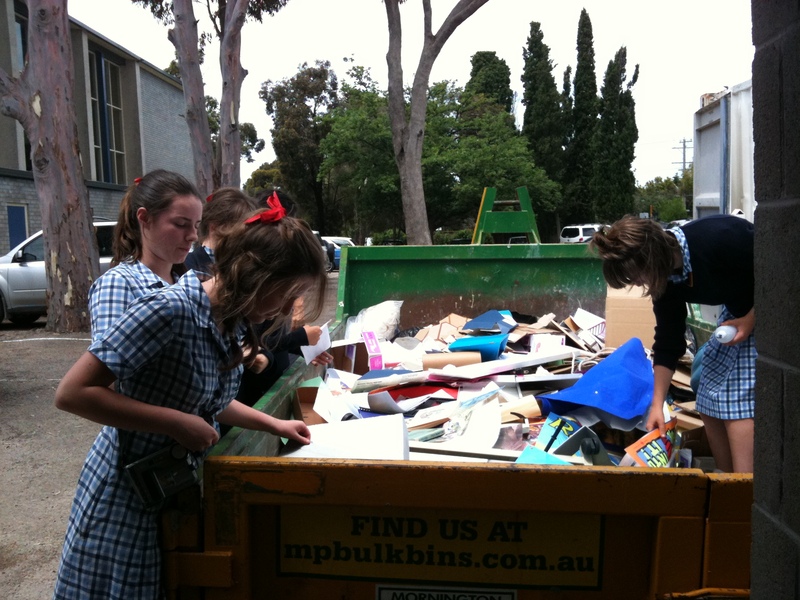 I am very grateful for all of the hard work undertaken by the library staff and maintenance staff at my school. It’s a trying process, but everyone contributed with good grace. 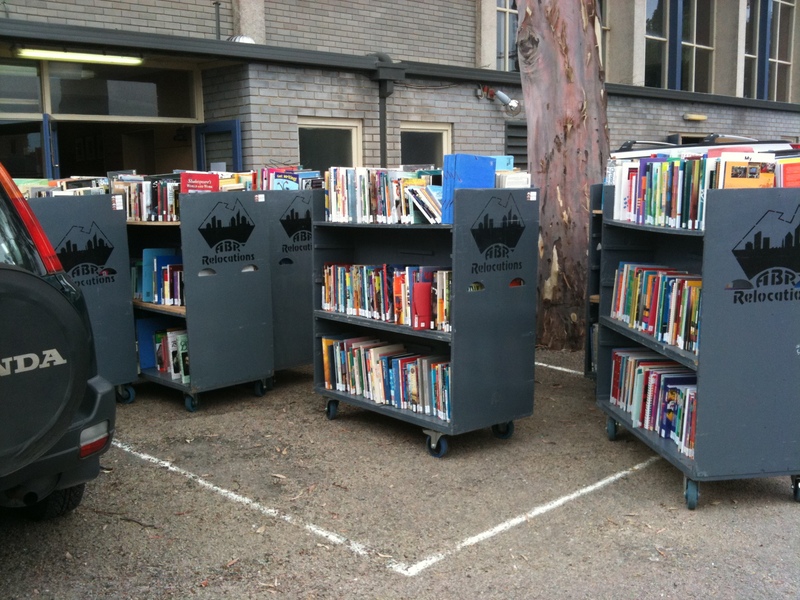 I’m not sure how long we’re going to be here, but we’re going to do all we can to offer as good a library service as we possibly can given the space constraints we have. Have you ever done any stop motion video work with kids? If you have, then you’ll know the time consuming process it is. I worked with a bunch of clever Grade 4 students this year creating some claymation videos. They took to it really easily and made some good stuff, but the mind boggles when you take a look at the video above. Watch the first one and then be amazed watching the side by side comparison. 440 hours of work. That’s right, 440 of them. Trevor Boyd and Steve Ilet dedicated this time to creating this to coincide with the tenth anniversary of the release of ‘The Matrix’. Check out their site with pictures and video links showing you how they did it. It’s been a big week for me. VITTA Conference on Monday, dinner with Steve Hargadon, John Pearce and Jenny Ashby Monday night, report writing and Library relocation the rest of the week (I’ll post some pics over the weekend). That spells exhaustion. So, off to the land of nod for me. Have a great weekend. This is the presentation I gave yesterday at the VITTA conference here in Melbourne. It was hard to gauge how it was received; it seemed like there were a fair few people there who may not yet be convinced about the benefits of Web 2.0.My message was pretty simple; if you want to understand how to effectively use Web 2.0, then start reading blogs written by the people who are talking about how it is best utilised in the classroom. In particular, my message was about using the tools for connective purposes. There are pages in the wiki I have created in my name that support this presentation. The page about blogs contains links to an array of great teacher (and non-teacher) bloggers who extend our thinking. It’s by no means a complete list, and I envisage adding to it over time. When I first started School’s out Friday posts I discovered improveverywhere. They have been a constant source of fodder for these posts, and I’ve been able to see the evolution of a great idea turning into a financial proposition. This latest video ‘I love lunch‘, was filmed for the US Today Show and has Ann Curry appearing in a cameo role. Improveverywhere have recently released ‘Causing a scene‘, a book about their exploits. I picked up a copy for our school library. They are certainly becoming more mainstream and it will be interesting watching their growth in the next year or so. I can feel a commercial media deal coming on! Today, for me, was one of those days where you reflect on life. I attended the funeral of a former colleague from a previous school. I’m reflecting because Pam’s life was cut short just when retirement was looming, along with plans for travel and spending time with young grandchildren. What was inspiring about the day was the turn-up of her former work colleagues to pay their respects. Pam was our school receptionist; she had impeccable phone manners and a smile for all who crossed her path. The school was not an easy one, some of the kids were difficult and the staff needed to be united. We were a real community and you could feel that today. Pam would have loved being a part of it. So, do something that makes you feel good this weekend. Enjoy life. I’ll try to as I put together a presentation about ‘Getting started with Web 2.0’ this weekend for the VITTA conference on Monday. Wish me luck with that one! 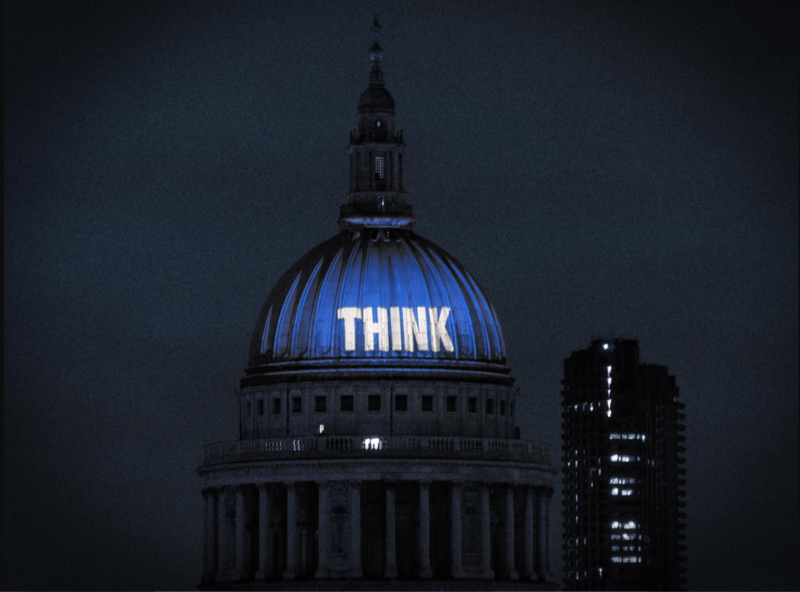 Can you pinpoint the moment in your life when you decided on your career direction? For me, I can’t pinpoint it to the exact date, but I can identify the time of my life. Once there was a little girl who went to a Primary School. She was the little chubby kid who had a brain in her head and who discovered a place in the school where she mattered. 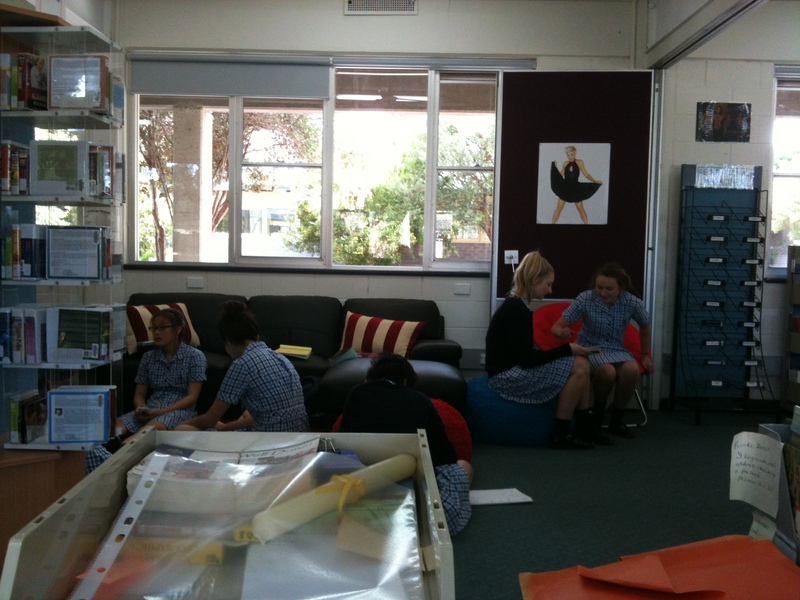 It was the school library. Unusually, it was run by two men, one of whom took an interest in her and encouraged her. He gave her responsibility and helped foster the love of reading that had been established early in life by her mother. He pushed her to read widely, even when it was Paul Zindel’s, ‘My Darling, My Hamburger’, and she had to go back to school and kindly inform him that really, this book wasn’t suitable for someone in Grade 5. He gave her ‘The Nargun and the Stars’ for her work as a Library Monitor, and even though she didn’t really like the book, she kept it on her bookshelf for years; it followed her from house to house through her married life and still occupies a place to this day. The man’s name was Wayne Hassett, and to this day, he has no idea of the influence he had on this young girl’s life. He helped her to love libraries and harbour the desire to be a Librarian when she got older. That little girl was me, and yes, I did become a Teacher-Librarian. Last Friday, I stood on a stage in the Clemenger Theatre at the National Gallery of Victoria and accepted the John Ward Award from the School Library Association of Victoria. The award is given to a recipient who demonstrates an outstanding contribution to learning and teaching at their school and raises the profile of the profession through their role as Teacher Librarian. It was one of my life’s proudest moments, and in my speech I paid homage to the Teacher-Librarian who all those years ago influenced a little girl to pursue a career where she could encourage others to experience the joy that comes from reading and acquiring knowledge. So, all of you out there. Do your job well. Do it well so that you can motivate others, spark a desire within them to reach for their dreams. You never know who it is that you are influencing, who out there is remembering the kind word, the encouraging comment, the friendly smile, the nudge to extend themselves beyond what they thought they were capable of doing. It’s probably the most important thing we can do. *SLAV’s blog, Bright Ideas, have posted about the award – thanks very much to Judith Way for writing such kind words about me. Judith, herself, was a well deserving recipient of the innovator’s award last Friday at the ceremony. Congratulations Judith! I can’t wait to show my son this latest effort from the improveverywhere crew. This is Grocery Store Musical. My son is a huge fan of Food Court Musical and I am too. I don’t think this one lives up to the quality of Food Court Musical, but it’s still worth watching and raises a smile. Been a busy week for me. Camp all week, writing a blog from there for parents, and today I was the recipient of the John Ward Award from the School Library Association of Victoria. I’ll write more about that over the weekend. Pretty worn out right now and in need of a sleep-in! Have a great weekend. Hot one coming Melbourne’s way. I’m on camp at the moment and the iPhone has come into its own for me. I’ve only had it for a week and a half, but already I am viewing mobile technologies and their relevance for education in a whole new light. The phone has become my digital camera for camp happy snaps. I can upload the pictures easily to my computer for the blog I am writing for the parents. It’s even taken video of my daughter’s efforts on the giant swing. It’s my instant weather update. In the heat we are experiencing I am able to check the CFA updates to see if fire conditions might be an issue for us. I can stay connected to school and my online network through the access I have to email and twitter. If I wanted to, I could read Macbeth or A Christmas Carol (or any other out of copyright book!) through the Stanza application. I can access the iPod within it and listen to the Red Hot Chili Peppers. In the tent my Just Light application is acting as a torch so I can locate what I need in the dark. The Google Maps application assisted us on the first day when our bus driver got lost and we couldn’t find the camp location. Google got us there! Why on earth wouldn’t any student who has one of these powerful tools in their pocket not be using it in classrooms today? Why would any school ban them from access to information they can use for the course they are studying? My iPhone has been configured to my school’s network so that it will tap into it when I’m there. My thinking is that we should be doing the same for the students. Rather than ban, let’s embrace and support them in using these tools to their maximum potential. I know that I have only tapped the surface of what it can do. Can’t wait to see what more I can learn.